The centrally located VVV (Tourist Information Office) at the foot of the Dom Tower) isn’t just a good place to get a hard copy of Utrecht In Your Pocket, but also a great venue for advice and souvenirs. If you’re looking for expert tips on sightseeing or would like to rent a bike just talk to one of the friendly staff. The Tourist Information Office is also a great place to buy an Utrecht souvenir. Unlike many other souvenir shops, you’ll find a wide selection of items that refer exclusively to Utrecht. 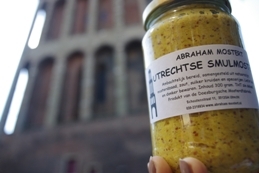 Utrecht In Your Pocket selected five of the most remarkable souvenirs here to make your shopping experience even easier. The undisputed number one gift would have to be the beautifully designed T-shirt, which is available for gents as well as ladies. It’s a white t-shirt featuring a red heart that’s being embraced by a cartoon-like figure wearing a little crown on its head that represents the Dom Tower. Naturally the town’s website is also present on the t-shirt. Definitely don’t skip the VVV if you’re keen on mustard. 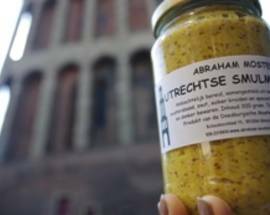 For €3.25 you can buy a 300g jar of Utrechtse Smulmostert, which is good with meat or in an authentic Dutch potato casserole. Obviously the ubiquitous Dom Tower logo is also depicted on the label. 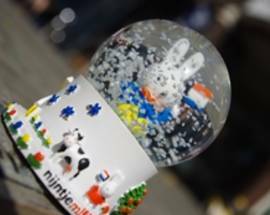 This survey wouldn’t be complete without Miffy, or Nijntje in Dutch. The city boasts a museum entirely dedicated to the small rabbit, which is tremendously popular in Asia. 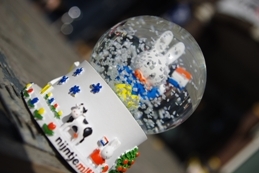 The VVV sells numerous Miffy knick-knacks from fridge magnets and key rings to a small snow globe with Miffy inside happily waving a Dutch flag. Yes, you shake the glass ball and plastic snow swirls about. Although this may not be the ideal souvenir for you, people do pay good money for these sorts of things. All of this merchandise lines the shelves of the VVV, but its hiking brochures may well be its best selling items. 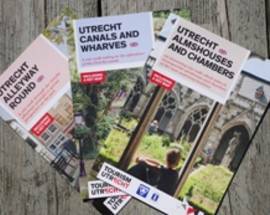 Written by a local VVV employee, you can discover a completely different Utrecht in these handy booklets. Each of the three walks takes you through a lesser-known part of Utrecht in approximately an hour and a half. The booklets are available in Dutch and English and cost €3 each. If, however, you’d like to know even more about Utrecht and you’re willing to spend a bit more money, there’s yet another option. 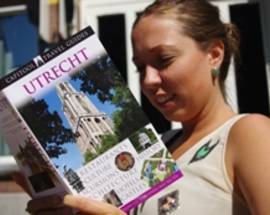 The Utrecht Capitool travel guide is a good investment if you’re really into the minute details of the city. For €25.90 you can buy this impressive 250-page reference book that’s full of all kinds of attractive drawings, pictures and historical information. 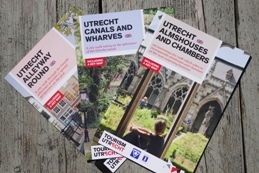 Together with a copy of Utrecht In Your Pocket you’ll have at your disposal the best and most accurate information that will allow you to completely enjoy this ancient and picturesque city.